Developed by platers for platers. Sterling's original mesh barrel* provided the first practical method for plating a wide range of thin or miniature parts. When Sterling developed the square hole cylinder, the combination of maximum solution transfer and current flow in a tough, durable unit became practical for all your barrel plating needs. 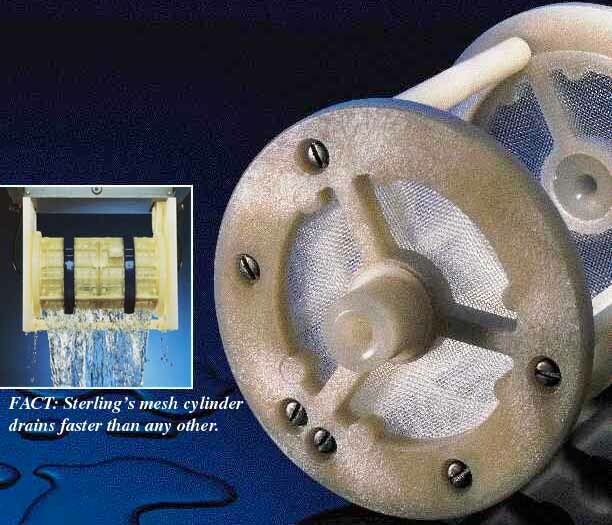 Certain Sterling cylinders feature this unique end panel mesh construction. This additional mesh provides even greater solution and current transfer resulting in faster, more uniform plating with reduced dragout. Another design improvement from the long-time leader in portable plating barrels...Sterling. For complete ordering information, please contact our factory or consult your Sterling representative. *U.S. Patent Nos. 3472753, 3498902 Other domestic and global patents also apply.